One of the neatest tricks about modern residential design is that everything looks so obvious, clean and organized … and it takes a lot of work and coordination to make things look easy. 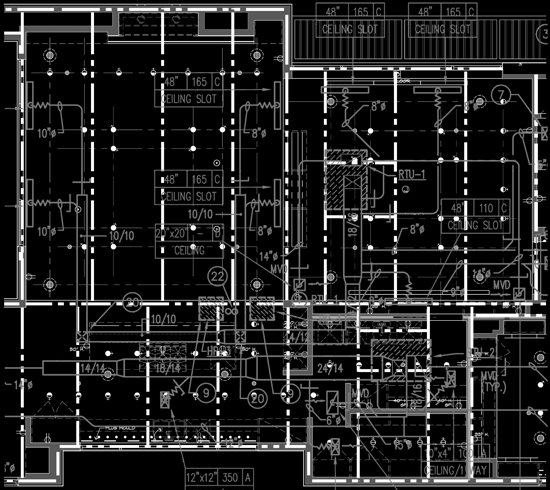 To provide some perspective, that drawing has about 1,650 square feet of space shown – the entire house has over 16,000 square feet. Consider locating over 800 light fixtures and 40+ speakers, making linear slot diffusers and rectangular supply and return air registers – all while missing structural beams and air conditioning duck work. Whew! It is enough to make your head explode and this is why you always provide construction observation! Finding out that your light fixture spacing doesn’t work because there is a beam conflict is expensive if you make that discovery while actually hanging lights. 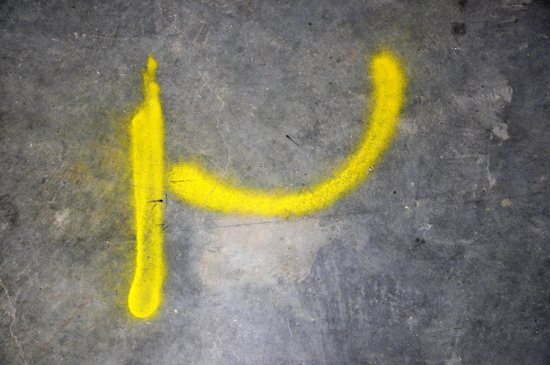 One way that we coordinate all the installation items in a cost-effective manner is by marking the locations of everything on the floor with spray paint. This isn’t rocket science but it is good construction technique. 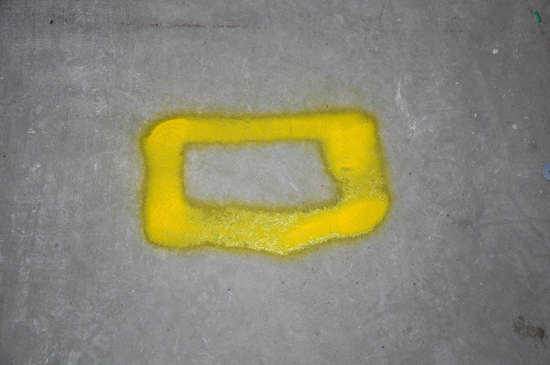 Straight Yellow Line – This is the symbol for a linear slot diffuser. 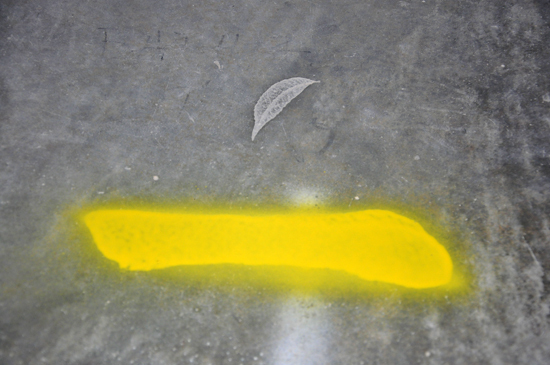 See that leaf print in the concrete? It just worked out that way As a bonus, I had the contractor place a leaf in the concrete anticipating the creation of this post and ultimately this photograph. It’s just another example of how organized my brain is and how forward thinking I am. I do it all for you because I’m a giver. 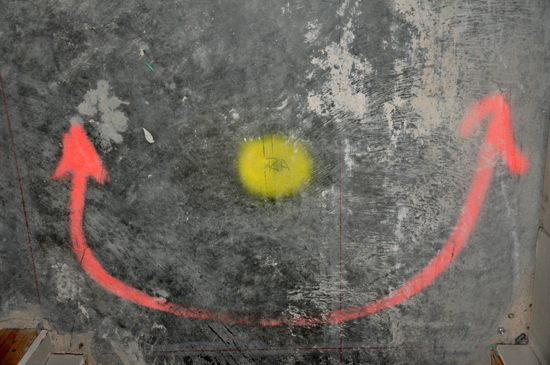 White Circle and Gray Blob – in this instance, the white circle represents a speaker in the ceiling. 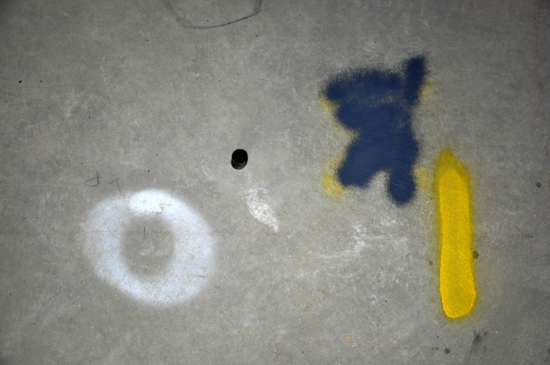 The gray blob is the spray paint equivalent of an eraser. 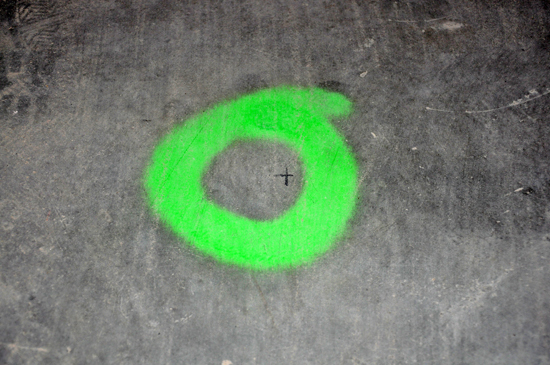 Green Circle – in this photo, the green circle’s represent recessed down lights. Straight Yellow Line with a Swoop – maybe you could guess?….. a slot diffuser and the swoop is the direction that we want the supply line to take. Orange Lines and Swoops – the orange lines represent where we are bringing sheet rock up to the underside of the decking. We do this to control noise movement from room to room and to reduce the areas above the ceiling to conform with fire zone requirements per building codes. 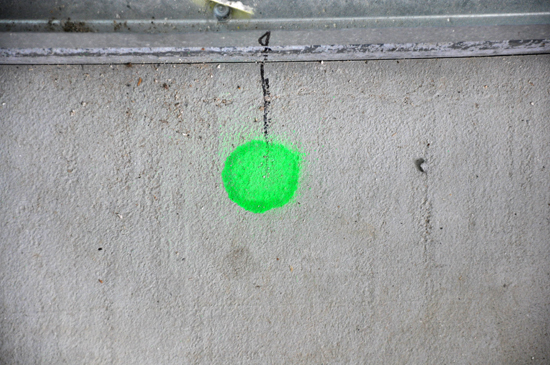 Green Dot – recessed wall fixture … in this case a step light in a stairwell. 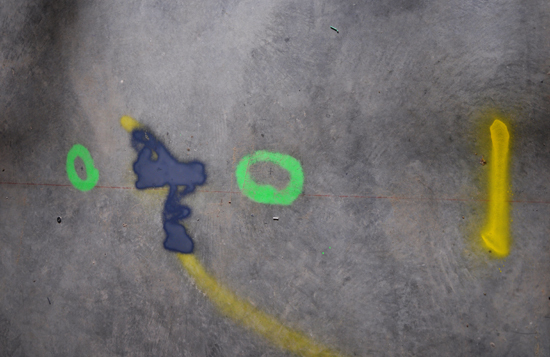 The entire house is covered in spray paint hieroglyphics as if some urban graffiti artist snuck in and tagged our project … but once you know the language and the intent, there is a story being played out on the floor. Most of our projects are not anywhere near this large or complicated so this is not a typical level of coordination. The intent and process on all of our projects is very similar – but a little more relative to their size and complexity levels. This is also an indication of pride, craft and coordination from the contractor, after all … it is their language. I am just an interpreter. 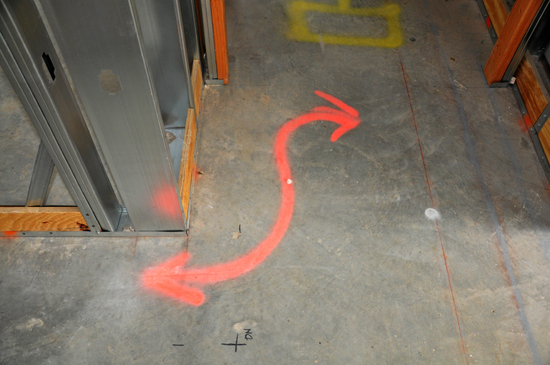 Try and gets some construction graffiti on to your project.